Back to posting after a while… busy with working on a musical project – I thought I’d get on with my eternally favourite raga : the emperor of Ragas: Raga Darbari. Words cannot adequately describe the majesty of this Raga. In many ways, Darbari encapsulates all there is to say about Hindustani Classical music: the repose, the space, the meditative nature, the plaintive aspect, the introspection… the list goes on. For those who ponder the difference between Carnatic and Hindustani music, Darbari is the prominent example of the philosophical difference between these two systems and the contrast in their approach. While some say the origins may have been in Carnatic music, Darbari is the encapsulation of the Hindustani style, in particular, the meditative nature of the music. Darbari has influenced everyone from ancient Dhrupad singers to Himesh Reshammiya to Abhijit Pohankar. Such is the scale of this monumental raga, etiquette demands its performance in a respectful manner, taking care not to transgress the boundaries of the raga. Historically performed by Miyan Tansen in the court of Mughal emperor Akbar, Darbari has been restricted to performance by senior musicians only – as a matter of tradition. For a long time, women performers were not allowed to sing this raga. Darbari is also not well tolerated by purists on newer instruments. The essence of Darbari is its repose and majestic build up. Due to heavy meend work (portamento), Darbari carries shades of previous notes onto the next notes. Without sympathetic strings, that flavour is lost. Why do I consider this the perfect Darbari? One, it is slow and full of repose. Two, it dwells upon the lower octave and draws out the gravity of the raag. Third, it “lets go” down to the lower Dha and stays there for a while, without rushing back to the Sa. Darbari rendered on instruments face the challenge of keeping the music interesting after the alaap. As the raga is not designed for high speed, this proves a bit of a challenge. 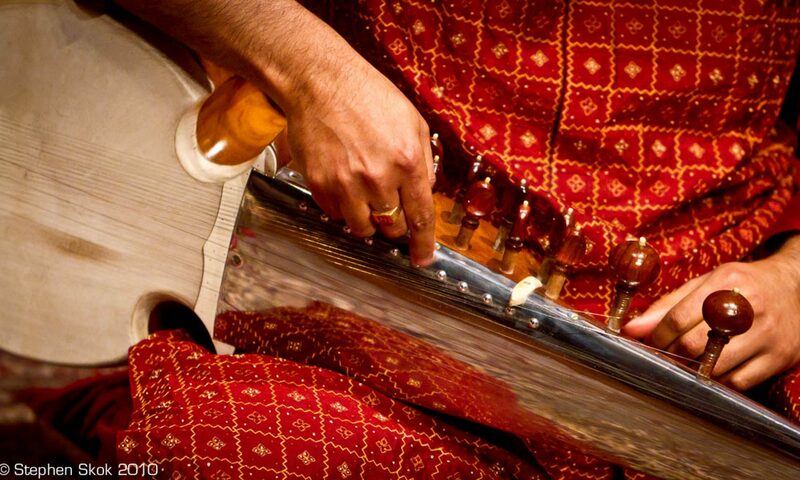 The sarangi, surbahar, veena and sarod are particularly well suited for rendition, however, the published repertoire on the sarod does go up to higher speed, which, in my opinion, diminishes the appeal of the pure raga. Note that dwelling on a lengthy, repetitive alaap is probably not good either – unless you have the musical material, you’ll put audiences to sleep. The second is Ustad Vilayat Khan with Shankar Ghosh – recorded in the 60s – he takes Darbari on a “sitarised” journey – it’s spectacular though – I was gobsmacked when I first heard it. This is also an adaptation of the famous khayal “Anokha Ladla”. The third is Ustad Amjad Ali Khan with Sabir Khan – this is a master class of how to approach Darbari on the sarod – the approach of the compositions is very fresh and not the traditional sarod approach. I will record and document the notation in my next post. Ustad Vilayat Khan’s piece is loosely based on the drut khayal “Anokha Ladla” sung by greats such as Ustad Bade Ghulam Ali Khan. Ustad Amjad Ali plays no vilambit (he has a policy of not playing vilambit if the alaap jor jhala is extensively treated, especially in a time constrained situation -e.g cassette recording). Secondly, the drut ektaal piece has two parts: the second part settles into the famous ektaal composition Yareman Biyan Biyan, however, the mukhda is a complex rhythmic piece which uses an off beat Sam (I’ll publish the notation shortly). Thirdly, the drut teentaal piece is possibly the highest clarity Darbari played on the sarod at that speed – especially if you pay attention to the right hand bols being executed at the same time in the ekhara phrases. Fourthly, the sound engineer has gone nuts over adding a concert chamber effect to the sound, although it sounds ok. Fifthly, I was advised that Ustadji waited for a long time before recording this masterpiece and used his largest sarod for this performance. Many thanks for posting Pt Ram Narayan’s raag Darbari; which is Emperor of ragas. It is very beautiful. We presented Panditji in Wolverhampton through our cultural organisation Surdhwani; which was founded by my husband, myself and other connoisseurs of ICM. Panditji’s concert was a sell-out. I also heard his raag Jog in an All-Night concert in 1981 arranged by BBC Radio 3 Live Broadcast. It was simply unforgettable. My husband and I listened to the whole programme and I still remember some of the renditions. I wish we had more of those All-Night concerts in London! I am very keen to listen to Darbari by Ustad Amir Khan, Ustad Ghulam Mustafa Khan & Ustad Rashid Hussain Khan. I have the L.P. of Ustad Amir Khan, Ustad Ghulam Mustafa Khan’s on a cassette and Ustad Rashid Hussain Khan’s on a CD. I also enjoyed listening to the Sarangi Samrat Ustad Sabri Khan’s renditions, one on his own and the other with his son Sarvar Sabri on tabla. We presented Khan Shaheb in March 1991 and it was almost sell-out concert. I love to listen to Ustad Sabri Khan, Pandit Ram Narayan and Ustad Sultan Khan’s sarangi. It is a pity that I couldn’t listen to Ustad Vilayat Khan with Nikhil Ghosh and Ustad Amjad Ali Khan with Sabir Khan’s renditions on raag Darbari. We have Ustad Vilayat Khan’s raag Darbari with Pt Shankar Ghosh and it is out of the world. I always travel with it when I go on holidays. Please check our blog http://surtarangthewaveofraga.blogspot.com for all our playlists starting from 29 December 2010. Many thanks for sharing the sound of sarangi with us. Hello Maitreyee – thanks for your comments – I’ve edited the post to fix the typo (Shankar Ghosh is indeed the tabla player on that legendary performance) and also put in links to both Ustads’ performances. I have also immensely enjoyed Ustad Sabri Khan’s Darbari. Your list of incredible Darbari performances brought back many fond memories. I consider myself blessed to have been exposed to such a raga – it’s the world’s eighth wonder ! And I certainly consider the sarangi the best instrument to convey this raga. You are certainly doing a wonderful job in keeping our finest cultural tradition alive – I will certainly try and tune in to your broadcast despite the time difference. As a tabla student of Pt.Shankar Ghosh, it was very heartening for me to see that u have so aptly mentioned Ustad Vilayat khans performance with my Guru in the 60’s of Darbari. Even though my field concerns rhythm, I literally worship Ustad Amjad Ali Khan…perhaps the most enlightened of maestros ever. A 1978 recording of Pilu Jungla comes to mind with Shankar Ghosh on the tabla which shows the developing style of the Ustad and emphasises beautifully on the thumri like element of the bandish. In 1980 he superbly essayed Faiyyaz Khans ‘Un Sangh Lagi re’ in Ramkali at the Dover Lane music conference. ‘Kaise ye dhoom machai’ in Zila kafi, ‘Kinare Kinare Kinare Dariya’ in Yaman, ‘Beeti jaat barkha rut’ in ektaal Desh and of course Aamir Khans ‘Guru Bina Gyan’ in Marwa are adequate examples of how Amjads music is replete with fabulous vocal bandish. So goes with ‘Piya Milan ki aas'(Jogia),’Jhan jhan jhan payal baje'(Nat Behag). Not to forget the unbelievable clarity and aesthetic sense with which he plays the Razakhani gats to this day…whether in Behag or Darbari or Bhairavi….Id like very much if we could be in contact and perhaps if I may have the opportunity to play the tabla with u if u are in Kolkata or otherwise…Thank You and Looking forward. Hello Krishnaroop – thanks for your comments. I’m a great admirer of Pt Shankar Ghosh. Re: Ustad Amjad Ali Khan, as I came from a vocal and western classical guitar background, he immediately stood out from the rest of sarod players in terms of sheer clarity and aesthetics of his sound, compared to the rough, leathery and wooden sound of many of his fellow sarodiyas. (especially at rising tempos). This genius changed the sound of the instrument for ever and made huge technical innovations – something that no-one else even in his own gharana has been able to match, let alone surpass. The greatest technician of this instrument, without a doubt. Heavily influenced by Ustad VK and Ustad Amir Khan, he was able to bring some of their heavenly music to the sarod, adding his own unique style. Thanks for mentioning those vocal inspirations. I’ve had the good fortune of hearing Ustadji sing these khayals and illustrating how he adapted them to the sarod. He took the bold step of moving away from the dara-diri compositional structure to adapt the free flowing khayal structure, which allows him to integrate better content across vilambit, madhyalaya and drut – complete with bols, ekharas etc. I’m in Kolkata every other year – often to get the skin of my sarod changed. I’ll drop you an email when I visit – would love to catch up. Thank You…Id really appreciate that…. You can do what I did many years ago – see him backstage after the concert (it can be difficult, but possible). Or, write to him via his website. Alternatively, if you have friends in your tabla circle who know his senior disciples, they can put you in touch as well. Hello Indira, I’m overseas at the moment – will try as soon as I’m back late October. . Truly a majestic raag. Have you heard ku ba ku, a ghazal by Mehdi Hassan? Yes, set to Darbari…more in an easy listening style.. Please i spend several months looking for notation to play darbari in bansuri. Anybody has the notation like yaman appears in http://www.flutebansuri.com/raga-yaman-alaap? or point to a resource where to find it?